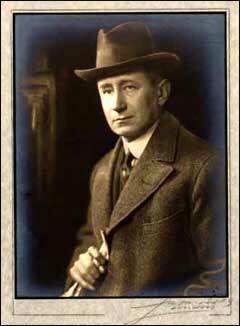 Intro from Jay Allison: One hundred years ago this week, Guglielmo Marconi made his historic transatlantic broadcast from Cape Cod. Imagine: on that day, there was only one message traveling in waves in the air. How many swirl around us today? Our neighbor Dennis Downey has written an homage to that moment and to this one. He borrowed a cassette machine from us and recorded himself here on Cape Cod. I have a work room in town. It is a book work room. The towers and buildings at the South Wellfleet station in Cape Cod. I built it with lots of shelf, desk and bench space. It has 8 large windows overhead and is very good for pacing and thinking. I recorded the pieces on a Sunday morning with two windows open when the downtown is generally quiet. I put the recorder and its buttons right in front of me on the tall work bench. I hung the text from 4 clipboards at eye level. I put the mike on a book shelf in the middle of the clipboards and anchored it with books. I talked standing up and more or less toward the mic. January 18, 1903. 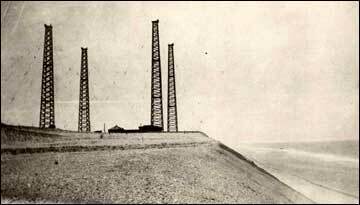 Guglielmo Marconi made history on Cape Cod (Truro, Massachusetts… at what is now Marconi Beach) by successfully transmitting messages between the President of the United States and the King of England. 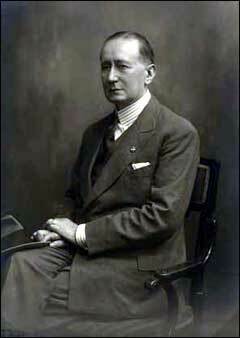 Marconi was born on April 25, 1874 in Bologna, the second son of a runaway marriage between a wealthy Italian landowner, Giuseppe Marconi, and Annie Jameson of the Irish whiskey distillery family. As a child, Marconi was a loner with manual dexterity and a penchant for inventing “scientific toys,” for taking things apart and putting them together again. So, a geek of sorts. He was energized by other wireless explorers, particularly Heinrich Hertz. He started with a few yards in his attic increasing to a few kilometers in his backyard. No scientist thought there was any commercial viability to this pursuit, but Marconi had a head for business too – and proved them all wrong. 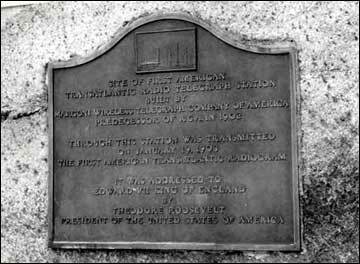 The memorial plaque on the monument at the Marconi Station at Wellfleet in Cape Cod, MA. Site of first American Transatlantic radio telegraph station built by Marconi Wireless Telegraph Company of America, predecessors of R.C.A. in 1902. Challenged by the barriers to communication — distance, fixed cable, and line of sight — Marconi became a wireless pioneer. The world became smaller and safer, more varied and open for every set of ears. We got radio. Through this station was transmitted on January 1903 the first American Transatlantic radiogram. It was addressed to Edward VII King of England by Theodore Roosevelt, President of the United States of America. Writer...lives with his family on Cape Cod. Born in New Bedford...1956. One of 10...Irish Catholic. Dennis Downey moves and talks with his whole body in order to explain things. His work explores an implosion of history, language, culture and technology as we increasingly converge towards a world-wide tribe. 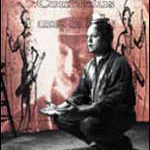 Since 1983, Mr. Downey has evolved the unique form and content of his action-talks in solo performances in nightclubs, art museums and small theaters throughout the Northeast. At once confounding, profound and exhilarating, Downey's performances describe a Large World just underneath our everyday lives. "I began as a standup performer in comedy clubs in 1983. Whenever I perform, though I prepare extensively with pen and paper, I always talk off-the-top-of-my-head and in-the-moment - in the way that people wrote before there was reading and writing. After a year in the nightclubs, I re-configured the work as action-talk performances in art. Since finishing Harvard in June of 1996, I have concentrated on developing high-level HTML designs for the Web while pursuing the prototype for a new, edu-tainment Web content that I call TextTelevision." Dennis lives in our town on Cape Cod. He came over to our office at the radio station and borrowed a portable deck to record something he’d written and then he brought us back the cassette with his voice on it. As you can imagine, after we first heard it, we all thought about decorating it with effects… swirling things, choruses and solos, whispers and waves of all kinds. We also thought about re-recording with a better mic in our studio. It’s a guy in a room with a cassette recorder. His voice is going out now over the Internet, and over the air, exactly one hundred years after that historic broadcast from Cape Cod, one voice, unadorned, traveling out by itself to drop on any and all of us — perfectly fitting, we think, with Marconi’s vision of radio, and with our vision of public radio. A very nice radio essay. I liked the images of the wave-circles and the broadcasting towers very much. One thing: I would have liked to know a bit about what Marconi said or broadcast in that first experiment. Does anyone know? I believe that Marconi never went beyond using Morse code. His contribution was to send signals wirelessly. If I remember correctly, Reginald Fesseden was the first person to send voice/music out over the air on Christmas Eve, 1906. Picture the wildness of ship operators having previously only heard "dot-dash-etc." suddenly hearing singing, violin playing, and dramatic readings coming out of the radio. Speaking in a Massachusetts accent still intact after 46 years, Dennis Downey delivers a lovely rumination on Marconi’s radio waves and radio place. When I visit the Cape I try and spend some time at one of radio’s holy places – the Marconi Site in Wellfleet. I’ll stand at the edge of the bluff looking East and back in time to Europe but feel the expansion and newness of the West at my back. Radio waves radiating across time. Downey’s lo-fi audiocassette recorded in a nearly bare sounding room seems a fitting technique to use to help commemorate this 100th anniversary of Marconi’s transmission. In the early days radio broadcasts originated from laboratories and not acoustically perfect studios. Downey’s voice in that room of his bounces around in an excited way, very reminiscent of the excitement heard in the voice / room interplay of the early broadcasters. An exuberance charged by crackle of spark gap Morse code transmitters giving way to the wonder of voices bobbing outward on radio waves. A wonderfully resonant work. Thank you. is where you can hear some of marconi’s broadcasts. There are a number of archived recordings that not suprisingly are a little scratchy! I loved this piece, I found Dennis’ voice very compelling, he sounds compelled to speak. It reminds me of a couple of comedian’s I used to see live in london comedy clubs, that meander through seemingly disparate subjects but which are all somehow brought together at the end in a suprising way. This piece of Dennis’s now wonderfully ends the hour we produced with HearingVoices.com now being aired on public radio stations around the U.S. It’s called "State of Union" and we just installed both MP3 and RealAudio files which you can find here at the HV site. I love the way the cadence of Dennis’ voice creates for me something of a time warp. His accent gets the piece sounding old fashioned to my far-away ears, which adds a nice & wavy layer to his minimalist delivery. Dennis’ use of his voice is also nice – the way he increases his own amplitude and frequency as he paints for us what Marconi did. The commemoration rains down through the quality of Dennis’ own sound. I got a lot more out of the piece the 2nd time through. Once was for sure not enough. The 2nd time I thought about how this piece would make a terrific addition to a science class somewhere. It made me think, too, about Buckminster Fuller, and about the book The Curious Incident of the Dog in the Night, which I just listened to on tape. This novel is written in a rhythm akin to Dennis’ here, and has a similar sort of a beeline impact. I started wondering if Dennis has ever considered making a living reading books on tape because in mho he for sure could … his tempo has a genuine irreverence that makes everything more meaningful. I like the ending – it makes me blush almost – the way he turns the spotlight on us, the listener. Throughout the piece, actually, I felt a similar sensation. His humor is so embedded that when it crept up I wanted to look around to see if anyone else in my empty room had caught that & was also laughing. Dennis, in these four minutes, builds a lovely balance of intimacy and community. hi what is up how are you doing i like this site it is so cool. I heard this piece on the radio as I was driving along the beach at Cape Canaveral National Seashore, a half-hour before dawn. I went to school in New Bedford, where I grew fond of visiting Horseneck Beach early in the morning, so Dennis Downey’s voice caught my ear. This piece was very moving, and not just because of its apposite context, timing, and shared sense of place. It was simple and profound. When it finished, I left my car and climbed over the dunes toward the beach. I heard the sound of waves’ ebb and flow, but couldn’t see them. Dawn broke then, projecting rays of light from beyond the curve of the earth, across the ocean and the beach. Sunlight illuminated three nearby radio towers, each powerful enough for your voice to reach a person in space, and to receive their voice falling down from the sky. Not far down the beach, another tower was finally made visible beside which stood the final space shuttle. Downey gave that moment its meaning to me: a shared sense of place and history; a perduring purpose to why we experiment and explore; our need to communicate our discoveries about life across time and space.